This section gives you information about how to install concrete pavers and other hardscape projects. It also gives you DIY (do it yourself) tips and advice. Click on the following blue links to access these articles. Come back often for newer articles. Pavers Over Concrete: Can It Be Done? A new driveway is probably the best investment you can make in your home’s hardscape and landscape. But a close second is a new patio, as it’s both a great financial investment and an investment in your enjoyment of your home and backyard. In addition, the best material to use for this purpose – the material that will maximize the beauty and value of your new patio – are concrete pavers. Best of all, if you have any sort of home improvement skill, you can install these patio pavers yourself! Note that if you don’t think you can handle building a paver patio, there are plenty of paver contractors who you can hire to do the job for you. Still, you should consider giving a DIY patio a try. This article will give you some tips and tricks to help inform you how to build a paver patio for the lowest cost and the lowest hassle. In addition, we want you to get the job done right! So some of these tips will be essentials when it comes to properly installing your new paving stone project, so listen up! The first step, after deciding to install a new patio, of course, is to plan and design your new application. Of course, you have near limitless options here, both in the size, shape, pattern, and color scheme of your new patio, so we can’t go into all those options here. The key is, of course, getting all of those features down in a sketch, or at least in writing, so that you can move on to the next stages in your building project. If you don’t feel comfortable doing this yourself, or don’t have any ‘eye’ for design, you can outsource this step. At the same time, I’d advise you not to underrate your own abilities – you know what you want and what you like better than anyone else. This site can give you plenty of ideas for sizes, shapes, colors, and patterns, so there’s a start for you at least. Check out our section on design ideas! This article assumes that you’re using concrete pavers, or paving stones, for your next project. In truth, natural stone or brick pavers will be similar to concrete pavers in many ways, though there may be some tips specific to those materials as well. Once you’ve figured out the plan for your next project, you need to pick the brand of paver you’ll use, the type, and the colors. Of course, picking one of these options will, in some ways, require adhering to another choice. For example, if you pick one brand of pavers over the others due to price, you’ll be limited to the colors and types of brick that that company sells. You’ll need to order your brick, crushed aggregate, and sand according to the square footage of your project. Before you call the paver manufacturer or mason supply yard, make sure to have the dimensions and square footage, along with any other special needs, at hand. They will tell you how much material you’ll need to complete the job. The exact amount will vary on so many factors that it won’t be very helpful if you were given an estimate here. If saving money is your game, there’s plenty of information on this site on how to find pavers for sale. This section will just be a brief overview of the important factors that you need to consider when installing your new patio. For a more detailed discussion of the steps needed to install paving stones, see this CPG article on paver installation. One thing you’ll want to do is ‘simulate’ using your patio. This means laying down your furniture in the dimensions of your new project. This is done to ensure that the space is ‘liveable’ and that no conflicts between the size of the patio and your furniture will develop. Another thing to keep in mind is grading, or pitch. You want to make sure that your patio is sloped away from your house or other sensitive areas of your yard. This will make sure that water doesn’t flood your basement, garden, or other areas of your home. Before digging in your backyard, make sure that you note the location of any utility lines. It can be both messy and dangerous if you split a wire or water line. You can call your utility company to do this for you; many will do the service for free, so don’t worry about the expense. The most important thing, bar none, when it comes to the quality of your project is the foundation, or sub-base. Spend most of your time on this aspect of the project – it will be time well spent. A poor base will mar even the strongest patio installation for years to come. When installing your patio, make sure your family members know not to step in the area while construction is under way. Disturbing the base or sand bed is obviously a good thing, but they should not even walk on the pavers until they have been properly edged and compacted. This includes pets, too – having Fido do his business in your freshly prepared base is a headache and a half! Don’t feel compelled to do all this work in one sitting or one weekend. In fact, for large patios, this may not even be possible. Dedicate one weekend, for example, to properly preparing the base. Spend the next on laying the pavers and applying the finishing touches. In addition, if you want some more outdoor patio ideas, go ahead and read this CPG article that will give you ten great ones to get you started on your next project! Among all the outdoor projects that you can build to enhance your own, the patio is among the most fun and valuable. Having a comfortable and beatiful place to entertain friends and family is worth the price of installation, and it will pay itself off many times over the years of use you’ll get out of it. Best of all, if you have the skills and desire, you can make your own patio without needing to hire a contractor and bear the brunt of that expense. In fact, a DIY patio is a great first project, as it is hidden in your backyard and doesn’t have to deal with vehicular traffic. If you messed up a new DIY driveway, for example, you’d have much more of a headache on your hands. To help you with your DIY paving project, we are giving you ten DIY patio tips to stimulate your creativity and get you thinking about your next project. Note: You can also find 10 DIY concrete pavers tips here. The first major decision you have to make is picking your material that will use. Some are more appropriate for homeowner installation than others. Concrete pavers, for example, are highly recommended here, as they are easy to work with and install. The only difficult aspect of a DIY patio pavers project is preparing the base – this is the most important part of the project, so the utmost amount of care should be taken to make sure it’s right. Your other options are brick pavers and natural stone pavers – these are similar to install, but they are more expensive, so are usually not recommended for beginners. Concrete is easy to work with if you know what you are doing, but difficult if you are unskilled. When designing your new patio, don’t be hemmed in by the old shape and size (if you have an old patio that you’re replacing, of course). Be creative and aggressive – expand your DIY patios beyond their original borders and outside of their previous shape. Even if you want to do the entire project yourself, you have a backup plan if things go sour – you can subcontract out pieces of the project that you can’t handle or are having problems with. This way you can still save money while making sure the job is done right. An example of this is with the paver patio – you might want to have someone come in and excavate the old base and install the new one. You can then lay the pavers on the sand bed yourself and complete the finishing touches. Speaking of finishing touches, don’t forget them. Many little tweeks are easy to do yourself and can add much beauty and value to your patio. For example, when laying your pavers, your do it yourself patio can be fashioned into an interesting pattern with a good color scheme. If you are installing a concrete patio, you can use concrete patio paint or outdoor patio tile to help spruce up the appearance of the plain concrete slab. If you want the look of pavers without the expense, go with stamped concrete for your DIY patio. You can find concrete stamps for sale and concrete patio molds to make the shapes and designs you want; simply press them into the surface of the still wet concrete. You should only do this, however, if you live in a mild environment that doesn’t experience regular freezing and thawing in the winter. Don’t forget the accessories. You can also DIY your own enclosed patios, patio doors, awnings, canopies, and other aspects of your patio that will add both form and function. Don’t forget the furniture or barbecue, either. If you are having trouble coming up with a unique and effective design for your patio, you can hire a contractor or designer to create the plans for you. This is often worth the investment, as the designer can give you suggestions as to what works best with your backyard, home style, and landscape theme. Think big. Just because you’re working on a patio doesn’t mean you can’t add other pieces at the same time. Consider building walkways, driveways, and pool decks at the same time as you’re making your patio. It will be easier and more cost effective to create all of it at once than to split up the projects across many months and years. Be free with your design. Don’t stick to straight (perpendicular and parallel) lines if you want something more. For example, if you are using pavers, consider adding circle kits and curves to your design. If you want more information on how to build a patio, consult with resources pertaining to your particular material. This website deals especially with pavers and paving stones of all kinds, so you might have to find other resources on concrete and other materials. If you are thinking of trying your hand at a DIY concrete pavers project, there’s a lot you should know before you begin. Whether you’re building a driveway, walkway, patio, or some other project, the more informed you are, and the more effort you put into the project, the better the final results. (1) Plan ahead – don’t wing it and expect that the project will turn out brilliantly. Think about the project you want to make, its dimensions, its patterns and designs. For instance, if you’re laying a DIY paver patio, sketch out its dimensions on paper and then use spray paint, stakes, and string to lay out the dimensions of the project in your yard. The more you plan, the better you’ll be able to anticipate potential problems. Plus, it will tell you how much material you’ll need. (2) The key to any paver project is its base. The more effort you put into the sub-base – made of crushed aggregate and sand – the better the project will turn out and the longer it will last. Don’t take shortcuts here – it may be tempting to lay the pavers over concrete, but this will be a suboptimal solution. You might consider contracting this part of the process if you don’t feel comfortable in your abilities. (3) Though DIY paving projects are a great way to save money, don’t go too cheap, both in the amount of time and money you spend. You don’t want substandard materials, especially the brick, as these will fade and break over time. You want to use quality material and quality tools in addition to quality processes to ensure that the final product will turn out to be of professional grade. (4) Speaking of grades, pay special attention to making sure the slope of your project will permit water to drain in the right places. The project should slope away from the home, flowerbeds, or any other sensitive area; if possible, have it slope towards a drain of some kind so that the majority of the water will leave your property (this is most appopriate for driveways that are close to the street). Having a flooded basement or landscaping can ruin what was otherwise a successful project! (5) When digging, be careful not to dig up any utility lines. This can be both expensive and dangerous if you cut or damage these lines. If you don’t know where they are, hire a utility expert (or ask the town) to find out where the lines are. (6) If you are thinking about installing more than one project (such as a paver walkway and patio), consider doing them at the same time. “Chunking” them in this way will be the most efficient, both in terms of time and money, as you’ll be able to order materials and pavers in bulk and use your own time and labor more efficiently than if you separate the installations of the projects in time. (7) To that end, do think about adding other additions to your projects. If you started out thinking only of doing a DIY patio pavers project, for instance, you may want to consider adding a walkway, driveway, pool deck, garden project, or other application to the schedule. If you already have the materials and the time, it may not be that much more expense to expand the project and have more of your yard look integrated within the overall design. (8) Though we advocate concrete pavers here, do realize that there are other hardscape options at your disposal, such as brick and natural stone pavers. While these materials are more expensive than concrete, you will at least be able to install them yourself, removing labor costs from the equation. (9) Use the right tools for the job. This will save you both time and aggravation. You don’t have to buy these paver tools, either – you can rent a plate compactor and diamond blade wet saw, for example. (10) If you are unsure, ask for help. Your paver manufacturer is the first source to go with specific questions about your project, as they will be able to offer you free advice that may help. For more specific, urgent problems, lean on the advice of paver contractors, even if this means you have to pay one for the help. Paying a little up front for good information may save you a lot of money and hassle down the line. If you want to use concrete pavers for your next outdoor applications, you are not limited to purchasing the materials directly from manufacturers, mason supply yards, or home improvement stores. In fact, if you want to save money, you can make concrete pavers from the comfort of your own home! Note, as well, that you can make many other concrete materials with this method. If you want to learn how to make concrete stepping stones, bricks, blocks, statues, and other shapes, read on, as much of the information below will apply. The benefits of making your own paving stones are clear. You’ll save money per stone due to the low costs of concrete. (See below, however, on this point, as you may not save as much money as you think.) In addition, you’ll be able to make the brick to your liking, and you won’t have to get involved with dealing with manufacturers, supply yards, and delivery of the material to your home. There are a few caveats to keep in mind before you make your own concrete pavers. First, realize that you shouldn’t do this unless you have the experience and skills required to work with concrete. If you’ve never poured concrete before and shaped it in molds, you may not be able to create “reproducible” bricks. In other words, each paver needs to be near identical in order for the project to work. (This is true, to an extent, even with an irregular pattern filled with different sized paving stones.) Thus, if you don’t have the abilities required, you’re probably better off buying them pre-made. Second, if you have a large installation coming up that will require a lot of brick, this may not be the best method for you. Think about it – if you can only produce 10 pavers at a time, and you need 1000, how long is it going to take you to get the supply you’ll need to finish the project? If the project is small, such as a mini-patio, it may be more doable. You could increase the size of the pavers, making the more slabs or flags, to lower the numbers of total stones you’ll need to make. Of course, if you only need a few of the materials, such as for stepping stones, then you won’t have this problem. In fact, making tons of pavers may not even be cost effective if you take your own time and effort into account. If it takes you twenty hours to make all the brick you need, how much are you really ‘spending’ through the value of your time? This is true even if the concrete itself is dirt cheap. One final reason not to make your own materials is that you’ll be limited in your design options. Making concrete pavers is difficult enough without worrying about color, size, shape, and so on. With manufactured pavers, you’ll be able to select from a wide variety of style, color blends, and shapes that you can then use to complement your already existing home design. The most basic do-it-yourself pavers will be an ugly, flat grey – usually not that appealing, especially if aesthetics matter for that particular project. If none of these warnings apply to you, read on! First, you’ll have to obtain molds for your pavers. There are two ways of doing this. First, you can buy molds pre-made. 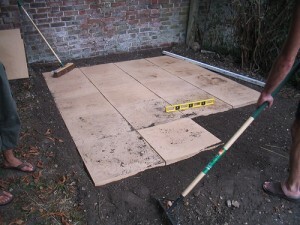 Doing this will allow you to pick the size and shape of concrete paving stone that you want to make. The second option is to make your own paver molds – click here if you want to learn how. Once you have your molds, it’s time to make your ‘paver factory.’ Set aside a part of your yard that will stay dry if it rains. Put some ‘mold release agent’ inside the mold to prevent the paver from sticking to the mold when it dries. Mix the concrete as directed, and pour it into your molds. Spread it to make sure it is level and covers all the corners. Bounce the concrete and mold to get rid of any air bubbles. Let them solidify over the next 24-48 hours. Remove the bricks or the molds when they are done, and prepare the next set. Note: if you want to add color or texture to your brick, do it during the pouring phase, as it will need to be mixed in with the wet concrete ahead of time. Consider experimenting, as well, with the shapes, sizes, and textures on the paver right after it has been poured in the mold. Once you’ve created all the pavers, stepping stones, or blocks you need, lay them as needed according to your design. Good luck! If you are installing a paver project yourself, whether it’s a driveway, walkway, patio, pool deck, or other application, it’s very likely that you’ll have to cut concrete pavers in order to fit them into the pattern. Most cuts are usually done when you include curves and fans in your design; however, even with straight patterns, especially running bond and herringone, you’ll have to cut the pavers near the borders of the project in order to fit the pavers within the specific dimensions. If you need to know how to cut concrete pavers, this guide is for you. It will tell you all the tools you need for marking and cutting pavers successfully. It will also provide some safety and efficiency tips to make sure that your project is a success. The first step you’ll have to do is mark out the pavers so that you now which ones to cut and where. Let’s say that you’re doing it near a border first. When you have laid the last brick you can in that course, take a full brick and line it up with the border in the same direction. Use it as a straight edge on the paver you just laid, and use a red masonry pencil to draw a straight line. Remove this marked paver and replace it with the full one you just used. Then, cut the paver on this line. Put the paver in the hole and you’re done with that course! Repeat as necessary to fill out the structure. IF you are creating a curved section of your paver project, you will need to get a soft, flexible strip of wood that you can lay down and bend. Beginning with the origin point of your curve, bend out the strip of wood according to how much curve you want – where you want it to start and where you want it to end. Then use your pencil to mark out the line on each of the affected brick. Take each paver and make your cuts, replacing them when finished. Finally, lay down your border course along this edge, making cuts to allow for a smooth curve throughout the border – you don’t want huge gaps or jutted corners throughout the border curve, as this will look terrible and unprofessional. Now that you’ve marked up your project as necessary, let’s talk about how to cut pavers. You will need some tools for this step. First, you’ll need safety goggles to protect your eyes. If necessary, get gloves to help you grip the bricks, as they may get wet and slippery if you use a wet saw. As for the tool to use to actually do the cutting, your best bet is a diamond blade wet saw. The diamond blade is very sharp and will thus cut through the paving stone like butter. The use of water will keep dust down. If you use a regular saw, it can work, but it also creates a ton of dust. If you have to do a lot of cuts, you will find that the dust will become overwhelming. Thus, it is best if you rent or borrow a diamond blade wet saw in order to do this work. To cut the pavers, simply place them within the guides of the wet saw and slowly bring the saw down on the paver. Only turn on the saw when the paver is properly set and ready to be cut. After cutting, move the saw to the ‘neutral’ position; then switch off the machine. Only then should you remove the paver and inspect your work. Go slowly. This will help you in two ways. First, you’ll make the cut more smooth and consistent. If you are ragged with your cutting motion, it will show in the quality of the separation. These saws are very dangerous – one wrong move could mean an injury. Over time, your proficiency with the saw will increase, until eventually when you will be able to make consistent cuts. One note about cutting – do you make cuts on the line, before the line, or after the line you’ve drawn? It ultimately depends on how you draw the line in the first place. You’ll have to experiment to find out what works for you, since sometimes you’ll have to “take the line” or “keep the line” depending on how you’ve drawn it. Of course, if you don’t have access to a wet saw, there are other options for you to cut the paving stones. For instance, you can do the old fashioned method – use a lump hammer and chisel to slowly chip away at the line – eventually, it will come free. Any uneven edges can be chipped off as necessary. You can also used hand held saws like skill saws or Stihl saws. You’ll want to be careful when using these if you don’t have experience, and make sure to use a carbide or diamond-tipped blade. If you are using a blade that normally cuts wood, it won’t work! Note as well that you’ll have to deal with the dust mentioned above, and the blade also may get dangerously hot over time. This could lead to burns and problems with the blade, even leading it to break or warp, damaing the paver, the saw, and potentially even you! If you are thinking of paving your driveway or other outdoor project, you probably want to know what cheap paving options exist out there to help save you money and aggravation. While the exact prices, and what turns out to be the cheapest option, will depend on your particular circumstances (such as the area you live in, the particular project you want to work on, etc. ), there are a few general cheap paving ideas that can get you started in your research. Perhaps the cheapest option out there is using loose stone or gravel for your driveway. This is easy to install, but it comes with heavy maintenance costs. Even if you put borders around the driveway, stone will get loose and will have to be raked and tended to often. In addition, plowing or removing snow from these driveways is near impossible without doing harm to the driveway, so don’t get this material if you live in a snowy area. In general, stone can look good with the right driveways and homes, but many people prefer hardscape options. Macadam, also known as tar and chip, is also quite cheap. It looks like a combination of asphalt and loose stones/gravel. You could also go with asphalt if you’d like, as this is quite cheap and, if installed properly, could last for awhile. Concrete, of course, is a popular option. This may not be the best choice if you have a huge driveway, but for small projects it works well. Make sure that whoever installs it does whatever it takes to minimize the cracking of concrete, but realize that concrete will eventually crack. Don’t go cheap here with concrete, as you’ll regret it when it starts cracking and looking terrible after one winter. Any option using bricks or pavers of any kind will be quite expensive as the pavers need to be laid by hand. Of course, if you do the work yourself instead of hiring a contractor, you’ll probably be able to install them relatively cheaply. This is especially true if you are able to obtain cheap paving stones from a variety of sources – for more information on this, see the pages on this website having to do with cheap pavers for sale. Clay bricks are a particularly good material, as they will handle the rigors of expansion/contraction cycles well due to their flexibility while also imparting some strength to your project. If you want to go the ‘paver’ route without using pavers, consider using bigger slabs. You can find cheap paving slabs and cheap paving flags more easily than cheap pavers, as the larger size of the material will make the price per square foot lower than pavers. This is due both to the size of the flag and the fact that fewer flags than pavers will be needed to cover a particular area. Note as well that you can save money depending on the contractor that you hire for the work. If you get a cheap contractor, you’ll lower the overall price of the installation regardless of the material you use. In addition, if you install the paving yourself, you’ll save even more money, at the expense of your own time of course. Keep in mind maintenance costs when thinking of your options. For instance, a material like asphalt will need to be sealed periodically, while stone or concrete will not. This can add up after awhile, so add the long-term costs to the short-term equation. If you and multiple houses in your neighborhood are getting new driveways, combine your efforts to receive a lower price for everyone. For instance, if you are installing asphalt, you can often get a much better price if other houses in your neighborhood are also getting new asphalt driveways. Talk with your neighbors to see what can be arranged. Permeable paving may also be a great option for you if you need something cheap, environmentally friendly, and permeable to water. Good luck! We hope this gives you some ideas to get you started! If you have any more ideas or thoughts, leave them in the comments below. Flagstone can be expensive, mostly because it is a natural stone material that is more costly than manufactured and artificial materials like concrete pavers. However, this expense can be lowered if you install the flagstone yourself. Flagstone patio installation can be difficult, though, even with the right tools and information. The skills and experience needed working with hardscaping materials may be above the ability of many homeowners, and they may benefit from contacting a contractor to do the work. However, if you believe you can do the work, here are some flagstone patio installation tips that may be useful for you during the project. Before you do any installation, you need to be clear on the design of your flagstone patio and the pattern in which you want to lay the material. Do you want to lay it directly into the ground, or do you want to install a sub base? Do you want the pattern of flagstone to be irregular, or do you want them to be regularly cut and in a specific patter, such as herringbone? You need to be clear on all of these questions before you begin, as the answers will have consequences for your flagstone patio installation. There are many different bases you can use. The general distinction here is between ‘wet’ and ‘dry’ installation. Wet installation requires the use of wet concrete and/or mortar, while dry installations do not. Dry are usually easier, but if they are not put together securely, they may not hold together as well. Some like to install it over a concrete slab. Others put it directly on top of the soil or ground. Still others simply put in a concrete/cement base underneath and mortar in between the joints. Still others use an installation akin to concrete pavers, with a base of aggregate concrete and a bed of sand for a more precise fit. The type of base you select will depend on where you’re installing the flagstone, what shape the stone is in, what patterns you want to lay, and other considerations. Each base type has advantages and disadvantages in terms of price, work required, and skill required, so weigh them out carefully before making a final selection. Always measure out the area of your patio before beginning. Use spray paint, stakes and strings, or anything that will help you. Don’t skimp on the sub-base if you’re going to use one. Whether it’s aggregate concrete, sand, or concrete, the foundation of your flagstone patio will be the crucial element that determines the strength and longevity of your installation. Make sure you dig deep enough, at least 6 inches, and use a plate compactor to compact the area after you’ve filled it in to the right depth with crushed aggregate or some other base material. You might consider having a contractor do this part for you, as it will be relatively cheap compared to the total installation process, and you’ll be sure that your base is properly installed. He or she could also give you tips and instructions on how to do the finishing touches on the installation. The difficulty of the actual laying of the flagstone patio will depend on the type of flagstone you are using. If you are using cut flagstone that arrives in regular shapes, such as rectangles or squares, the job is easier, as you can just put down a uniform base and lay the flagstone in the pattern you’ve selected. You’ll have to do some adjustments to make it level, but otherwise it’ll be pretty simple. However, if you’re using irregularly shaped flagstone, you may have to make adjustments while installing the stone in order to make sure that the final product comes out level. Simply use a rubber mallet and extra base material to even out the areas as necessary to ensure a level surface. How you hold together the actual project will depend on the installation method you’ve chosen. Some simply fill the joints with sand and wet it down. Others fill it with dirt and sprinkle grass seed in between to allow grass to grow in between the flagstone pavers. Others use a cement base, while still others mortar the joints. Others also add edging to the outside of the patio to hold it together. Use a wet saw, circular saw, or masonry saw to cut the flagstone if necessary to fit in your pattern. This may be important if your pattern is irregular, or if you are putting the pavers together in a ‘jigsaw fashion.’ Always be careful when using this equipment to avoid injury. Make sure that the area is graded, or sloped, properly, to allow the proper flow of water away from vulnerable areas and towards drains and other water sinks. You may need to use a plate compactor to secure the flagstone pavers properly, but this will depend on the type of installation you are doing. If you have any other tips, share them in the comments! Many people want to install pavers over concrete. Perhaps they have an old installation built on a concrete slab, or perhaps they want to avoid doing the work necessary to rip up an old concrete patio or driveway. Installing a base of aggregate may be the best option, but perhaps the best is not needed in this situation. A consumer or contractor may ask: can laying pavers over concrete be a good idea? In short, yes, it is possible, but with a few things to keep in mind. First, having a pre-set base like concrete will restrict your creativity and freedom to add to the patio, driveway, or walkway. With an aggregate base, you have the ability to create new patterns or shapes; this is not the case if you are installing pavers over concrete. Ultimately, whether or not laying pavers on top of the pre-existing slab will depend on the project type itself. Laying pavers over a concrete patio may work fine, since it will experience little stress, but a driveway constructed in this way may not be able to stand the stresses of vehicles. Second, the height of the installation will obviously be higher than it was. For instance, if you put pavers over a concrete patio, the height of the patio will be increased by the height of the brick. This may not be a big deal with certain applications, but in others it may be problematic. 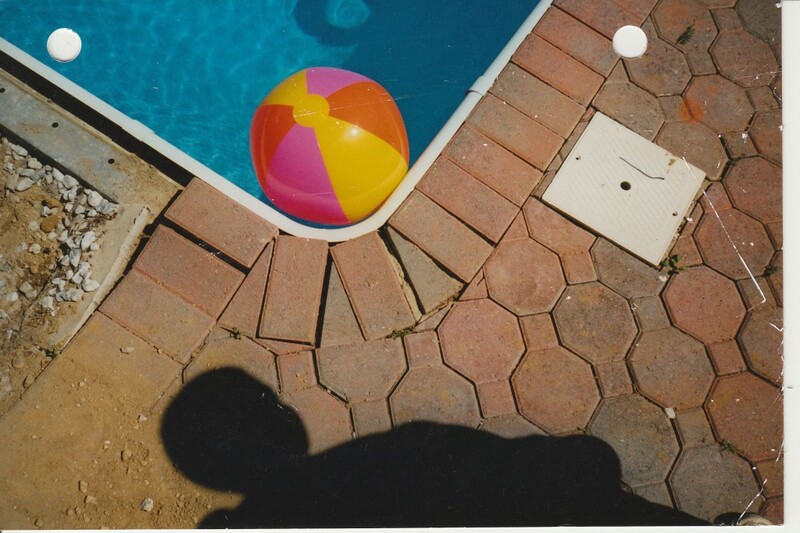 For instance, installing pavers over concrete for a pool deck may be a risky proposition, because if the pool pavers are too high, they may create a tripping hazard near the pool or may make people cut themselves when they are entering or exiting the area. Thus, you’ll probably want to install a new base for a pool area, unless you are using thin pavers and the heights work fine (see below about thin pavers). Another potential problem when it comes to the heights of the new brick may relate to grades or slopes – if you have issues with water pooling in particular areas, it probably won’t be corrected with this new paver installation. Make sure that there will be no problems with water as a result of this installation, as it will not be able to drain easily through the pavers with the concrete underneath – the last thing you want is a flooded yard or basement. You will also need to consider how you will surround the installation – with soil, mulch, or stone. Otherwise the concrete slab and borders will be exposed and will not look good. This amount of material could cause problems itself. Third, installing paving stones over a concrete slab may be easier, and thus within the skill of a homeowner, the finished product may be somewhat disappointing. In particular, if freezing and thawing during the winter months cracks the concrete underneath, the patio, driveway, or walkway may be thus adversely affected, perhaps settling or developing its own unsightly cracks or sunken patches. Note that water and ice are constant dangers – if the water seeps through the patio and rests on the concrete layer below, and this water freezes, you may experience nasty heaving and settling. Finally, the project itself may just not look as good as one installed over a proper base. For instance, efflorescence is a problem for all concrete paver installations. This is the phenomenon of a white, chalky residue appearing at the surface of the pavers. While this is entirely normal and will go away with time, the problem is exacerbated if the paver rests on a solid concrete bed. Make sure that your concrete patio or driveway is entirely clean before you putting the pavers down. This will help prevent some future problems with your project. Actually installing the pavers will require some different methods and materials than a normal installation as depicted on other parts of the site. For example, you’ll probably have to use mortar for certain applications, as the standard sand bed/compacting method may not work. Make sure your contractor is trained in doing this procedure and has experience with it. If you are installing the project yourself, make sure you check with someone in the know (like an experienced contractor) who can help you with your particular situation and its installation. In addition, using different materials on top will affect the conclusions described above. Using concrete pavers is one thing, but using stone or brick pavers over concrete is another. You will have less problem with efflorescence with these options, but you may have more drainage issues with them, and they may not withstand certain stresses well. Another thing to consider here is price and cost – if you are going to lay a lot of money out for expensive materials like natural stone pavers and flagstone, why not just go the extra mile and get it installed correctly on a fresh base? One viable option if you’re just looking for a veneer on your project is to install thin pavers over concrete. These will replicate the look of regular pavers while also helping to preserve height – they are thin so that they don’t create a tripping hazard or mess up grades. However, note that they will have to be set with mortar, so you might have cracking and other disturbances appear, especially if the base below is faulty. You could also lay down outdoor patio tile on top of an already existing concrete installation – this will give the project the new look that you desire with a fraction of the cost and time. In short, installing pavers over concrete is doable, but has some negatives you need to be aware of. If money or time is not an issue, starting your project from scratch is the better choice. But if you are prepared to compromise on looks and customizability, installing paving stones over this base should work fine. Perhaps you’ve decided that hiring a professional might cost too much or be too expensive or risky; perhaps you trust in your own abilities to install concrete pavers, or you have a friend or family member in the trade, willing to help you. How do you go about installing paving stones for your driveway, patio, or walkway? Keep reading for some great hints, tips, and secrets for concrete pavers installation, straight from the source: someone who’s done it before! Installing pavers yourself is a great way to get a discount on your own project, as the labor costs are one of the major reasons for the relatively high prices of these installations. Before beginning your installation, make sure you have all the paver tools and materials you’ll need to complete the project. This process also assumes that you’ve already selected the paver sizes, shape, style and colorof your brick. Note that many of these instructions also apply to other paver materials – natural stone like flagstone pavers and cobblestone, brick pavers and clay pavers, rubber pavers, and even grass pavers. However, find instructions for these particular materials, as details may and will vary. If you are ever unsure, it’s best to consult with a professional pavers contractor who can give you advice about your specific project. You may also get contractors to do particular parts of the installation; for instance, you can hire someone to do the excavation while you act as the installer. For visual hints and tips on how to lay concrete pavers, see the videos at the bottom of this article. Determine the area in which the pavers will be installed, whether front yard, backyard, or the side of your house. 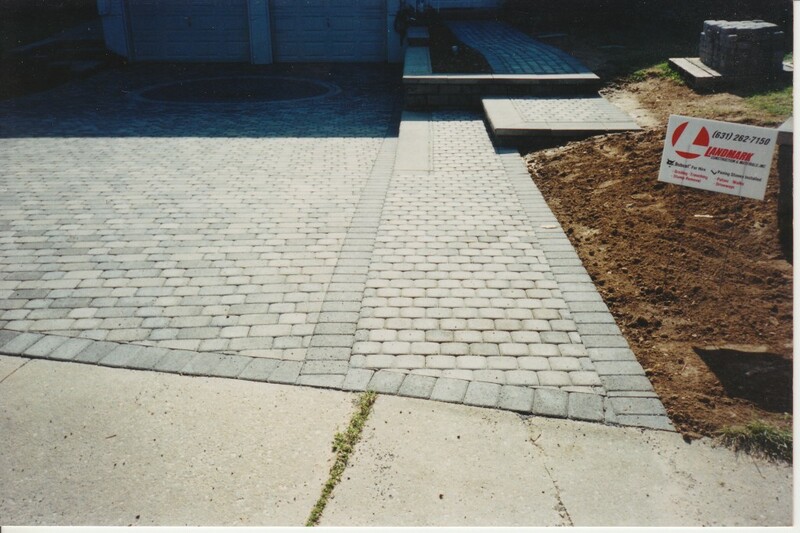 Pavers can be used in many projects, including driveway driveway pavers, patio pavers, walkway pavers, garden pavers, and more. Come up with paver designs (yourself or professionally) for how the project will look. How long and wide will it be? Will it have pedestrian or vehicular traffic? Obtain or make a sketch or plan for your paving stone installation; you can draw it out on graph paper or regular paper, just make sure you have all the dimensions and important features of the terrain marked out. Also make sure that there are no utility lines where you will do the excavation. TOOLS & MATERIALS: Paper, tape measure, pencil, camera. You’ll want to figure out the total square footage of the installation, as this will determine how much material (sand, aggregate, pavers, edging, etc.) you’ll need for the project. Don’t look to skimp on the cost of the project by not getting enough material – this will compromise the strength and beauty of the project. Once you’re ready to begin the project, sketch out your project dimensions in the area in your yard. You can use spray paint, for instance, to mark out the grass and soil for excavation. Add a buffer of about 8 inches along the sides of the project, as you’ll want to leave extra room around the entire project to complete the job. TOOLS & MATERIALS: Spray paint. Excavate the area to the appropriate depth (6-8″ pedestrian,9-12″ vehicular). Use shovels and wheelbarrows to remove the grass, sod, soil, and fill as necessary. You may also use a Bobcat or other machine to help this process. Make sure to remove it from everywhere you’ve marked, even the extra 8 inches that you’ve added to all the sides of the project as a buffer. Be careful to note any utility or electrical lines in the area – you don’t want to dig up a nasty surprise! Call utility companies as necessary to prevent any further problems. Note: Make sure you complete your project during the warm months, because if the ground is frozen this step may be impossible or very difficult. TOOLS & MATERIALS: Shovels, wheelbarrow, pick, Bobcat (optional), container/truck (to remove dirt/grass). Establish grade (slope) to let water flow/drain. Make sure the driveway (or walkway or patio) doesn’t pitch towards the house, as then you may have flooding. Also make sure there are no holes or dips where water can congregate. Interlocking pavers do drain naturally, and advantage it has over poured concrete or asphalt, but you still need to be mindful of where the water is going to go once you’ve installed your concrete pavers. TOOLS & MATERIALS: Level (a laser level is best). 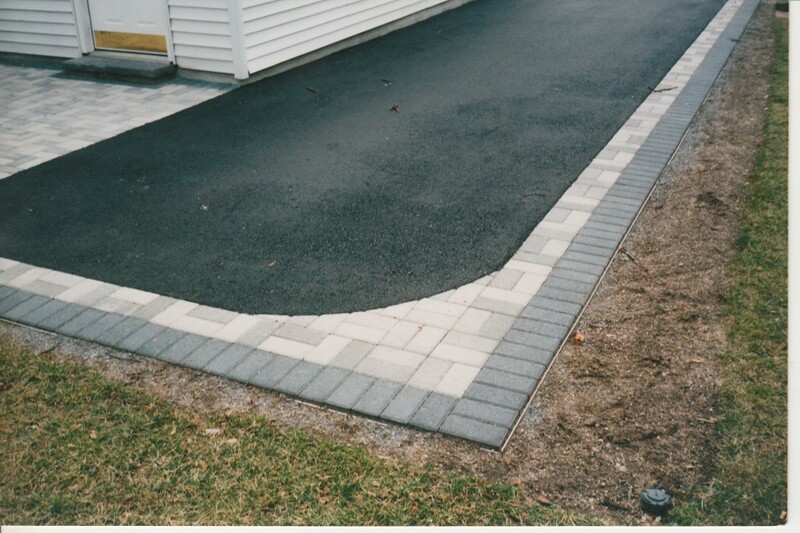 Lay lines and corners with string and stakes to mark out your intended paver installation. Don’t forget to include some breathing room (about 6-8 inches) around the entire design, but make sure to mark out exactly where the pavers are going. Make sure they are straight and parallel/perpendicular to the house, pool, or whatever reference point you are using for your design. TOOLS & MATERIALS: Level, stakes, string, tape measure. Determine the amount of materials you will require – aggregate, sand, and concrete pavers (and joint dust, if necessary). Make allowances in your order for waste and for cuts – leave some room so you order enough! It is possible to order less than full pallets. You’ll want to add 5% to your square footage for pavers to account for cuts and waste; make it 10% if your project will have lots of cutting. When you order material, simply tell the supplier the square footage of the pavers you need. Note that some pavers and color blends don’t work well with particular sized installations, particularly if they are small. Compact sub base. You will need to obtain either a hand tamper or a compactor for this. A compactor can be bought, rented, or borrowed. This step will provide you with a solid, compacted base. After compacting, ensure that the grade is correct, as well as the depth. TOOLS & MATERIALS: Hand tamper/compactor, tape measure, shovel. Spread aggregate base (3-5″ pedestrian, 6-10″ vehicular) and compact. This serves as the main layer of the paver base. You might want to add some moisture to the project before compacting to help it compact together more tightly. You might have to add more aggregate base if the ground is soft, such as if it made of clay, to ensure a more stable installation. Make sure that the grade/depth is correct. You can obtain this aggregate base (recycled concrete) at your local mason or supply yard. You can also use gravel, limestone, or any other large stone material. TOOLS & MATERIALS: Recycled concrete/aggregate base, shovels, Bobcat (optional), wheelbarrow, compactor/hand tamper, tape measure. Note that this process uses no mortar or poured concrete. This material will just crack and decay over time, damaging the integrity of your paving stone project. You may want to add the aggregate base in multiple layers instead of one single layer – some compactors can only handle 3 inches of material at a time, so make sure you keep the layer thicknesses manageable. The more time and care you put into the base, the better. Once the broad grading is done, you’ll want to go in and confirm that all the levels and grades are correct. You can use pipes and screeds to make sure the aggregate base is at the perfect level. Compact one last time. TOOLS & MATERIALS: Aggregate base, metal pipes, metal screeds. Spread 1 to 1-1/2” of sand over base and screed. You can either use fine sand or polymeric sand that you purchase from your mason supply yard or paver manufacturer. To screed, lay down 1″ PVC pipes parallel to each other, and use a wooden plank or metal plank to level out the sand. Fill in the pipe holes with sand and level out by hand. This sand base should not be disturbed. TOOLS & MATERIALS: Sand, shovels, 1″ PVC pipes, screed. Place your concrete pavers in the paver patterns according to your designs, making sure to keep them tight to each other. Carefully think out your laying concrete pavers strategy – will you start the paver installation near the edge of the house? Near another landmark? Somewhere else? Which direction will you go? This is all important to prevent future delays and problems. If you have a border, like a soldier course, you may want to start there first. Make sure you inspect the pallets to ensure you have the right shape and color of concrete pavers that you ordered. When removing bricks from the pallets, don’t just take from one pallet, working from the top down. To ensure color variety, you need to take each column of pavers (from top to bottom) from multiple pallets in order to get the right color blend. Periodically check for depth, alignment, and straightness (using tape measure, carpenter’s square, etc.). Use a rubber mallet to keep the pavers tight together, if necessary, or to level out any individual paver. Make sure you put down a wooden board where you are kneeling, or where you may be walking back and forth, in order to prevent the pavers from being smashed into the ground and thus becoming unlevel and creating holes or dips. Also keep away from the edges of the project totally, as these are the most vulnerable to weight and shifting. While you’re laying pavers, make sure to continually check on the pattern – have you made any mistakes? Catch them and correct them before you lay too many more. TOOLS & MATERIALS: Concrete pavers, mallet, level, tape measure, wooden boards, knee pads. Cut borders/other stones as necessary. Use a pencil/crayon to mark the pavers as necessary in order to make the cuts. This will be especially important if you will be installing patio pavers near an immovable structure (such as a house or pool or yard) and if you need to have any circular patterns or curves. To make smooth curves, consider using a thin piece of wood and bend it along your edge, marking each brick as a piece of this curve. Use a wet saw with a diamond blade if you will have to do a lot of cuts; if only a few are required, a dry saw will do. If cutting the bricks when they are dry, be extra careful of particles that could damage your eyes, nose, etc. Wear proper safety equipment – gloves, safety glasses, and respiratory protection. Make sure you know cutting concrete pavers tips and methods before attempting it, as you could ruin the brick or hurt yourself if you don’t know what you’re doing. TOOLS & MATERIALS: Wet/dry saw, pencil/crayon, straight edge. Put in edge restraints. 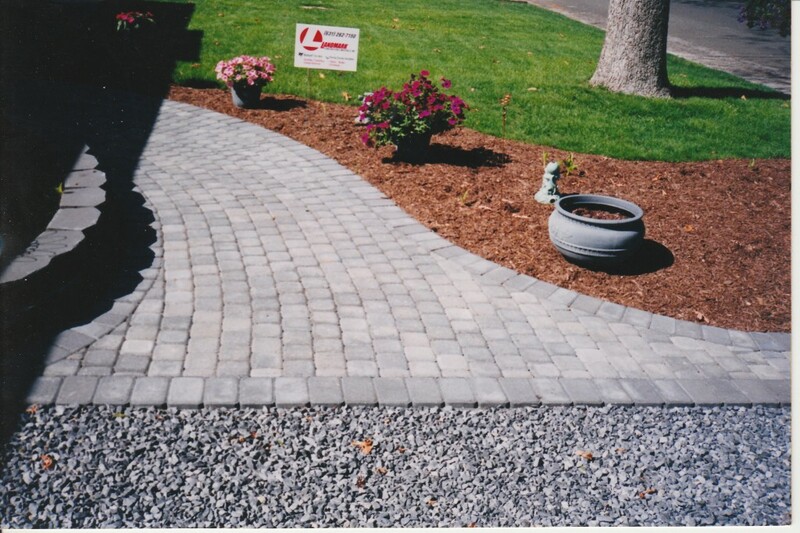 There are many different kinds of paver edging, from plastic to aluminum to concrete. The best, in general, is aluminum edging. Make sure they are tight and backfilled with fill/topsoil if necessary. Pound in the spikes with your mini sledge hammer. 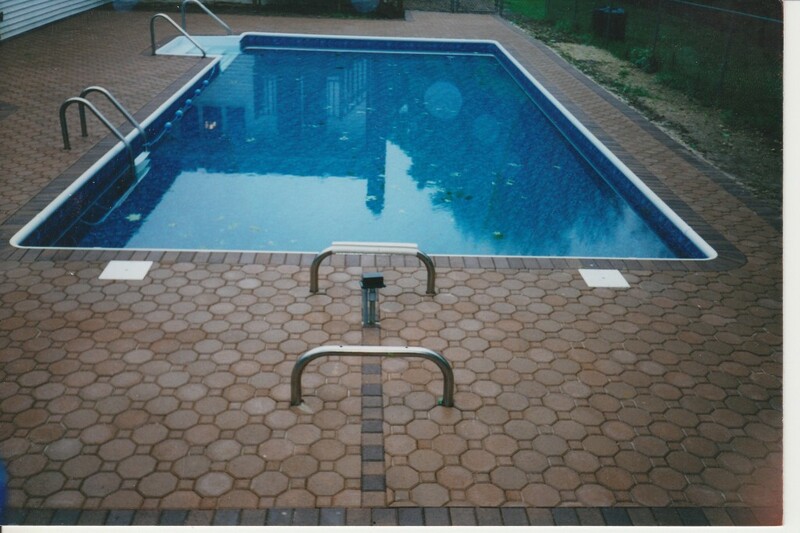 If you are installing pool pavers, you may have to add coping or other material to surround the pool and pool deck aside from edging. You may want to give the paver project a first compacting without any more sand added to the joints. This first compacting will begin the process by which the pavers interlock. Sweep the surface clean, and then sweep in more sand (or other joint material) into the spaces between the bricks. You’ll want to make sure the sand is somewhat coarse and irregular to encourage proper compacting. There are special kinds of paver sand out there for you to use for this step if you want to. Then compact with a compactor; this will “lock in” your project due to the interlocking action of concrete pavers. You may have to compact more than once. Clear off the pavers with a gentle flow of water – make sure everything drains correctly through and across the paving stone project. Congratulations! You’re done installing pavers, and you’ve finished your concrete pavers driveway, patio, walkway, or pool deck! Eventually, you’ll want to seal your pavers according to the instructions given to you by your manufacturer, but you won’t have to do this until the pavers have settled for a bit. If you need more help, check out these installation videos. Selecting a good paver contractor, one who is trustworthy, reliable, and skilled, is one of the most important decisions you can make if you decide to have your concrete pavers installed professionally. We know about all the horror stories about contractors: high or unfair prices, sloppy work, or not even showing up for the job! Especially if we have no friends or people we can trust to give us references, it might be especially hard to select the best contractor available. If you have an important job – carpentry, landscaping, masonry, or anything – and need professional installation, how do you find a trustworthy, licensed, skilled contractor? Read here for some tips and questions to ask to prevent an incident where your pavers contractor doesn’t show up or does substandard work. There are many ways to find contractors, all with different degrees of efficiency. The best way to find a reliable contractor is to get a referral from a friend or family member that already used his services. This way you will already know that the contractor does a professional job, and you can check out their work in person if you visit the referrers home. If can’t get a referral, try searching online for contractors in your area. Visit their website, if possible, to see examples of their work and find contact information. Also try searching for “pavers contractors reviews” or the “specific contractor/company’s name reviews” to find online reports from customers if they exist. This can be a great way to get an uncensored look into the company’s operations. If this doesn’t work, try the yellow pages. This is a rather antiquated method, however, as you will pretty much be throwing darts at a dartboard in this situation and hoping to pick out a good contractor. The final method is to ask a local home improvement store or mason supply yard for recommendations. They may be able to point you in a direction of specific contractors or at least a directory of local contractors who may be able to serve your needs. How many years has the contractor been in business? The more experienced the contractor, the better, though of course a new contractor is not necessarily a bad one. In particular, how long have they been installing pavers? Does your contractor have experience with the job that they have been hired to perform? The more experience with basic and advanced jobs (and all the potential problems that could arise) will allow the contractor to be more suited for the work. 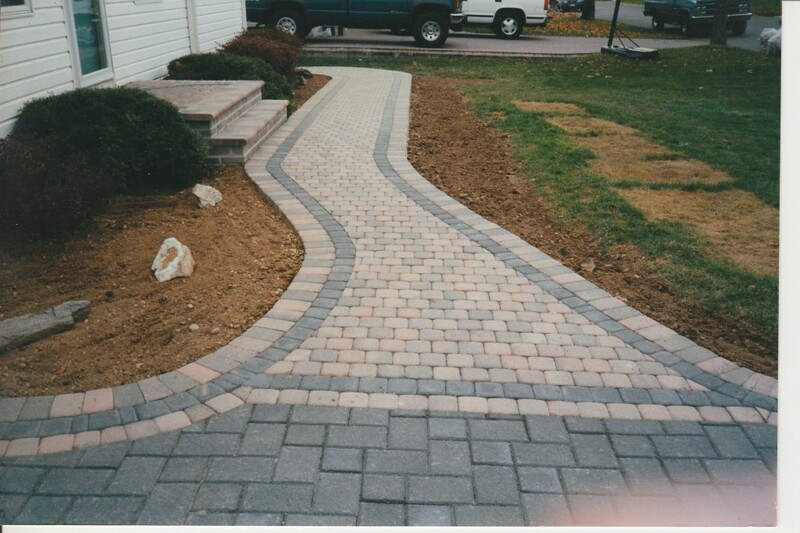 If your project (paver driveway, paver walkway, paver patios, etc.) is especially large or small, or has some challenging aspects, are they qualified to handle it? Many contractors will have photos of previous jobs, so ask to see them. Do you like their work, both the craftsman ship and the design? This is also a good way to get ideas for your own project. If possible, visit some of the contractors’ old jobs. Make sure, though, that the people who completed the work for those jobs will be completing the work at your home – otherwise, what’s the point? Can the paver contractors provide you with references? You could also ask around for unsolicited references, or check out third-party/commercial consumer advocates. As stated above, do a Google search as well for reviews. You could also check around with companies that sell the paving stones to see if they have any knowledge or recommendations. Do they have the proper insurance and relevant licensing to do the job? Are their workers legal? This is a particular concern in some countries where undocumented immigrants sometimes work as manual laborers. It is often best to go with companies that don’t employ these individuals. This is especially important considering Worker Compensation laws – having a laborer working off the books at your home is not good for you, the employees, or the contractor. Are any particular permits required for the work being done at your home? Have the pavers contractors taken any official training from a professional organization in their field, such as the ICPI? While this certification is not legally required, you can take comfort in the fact that they have the newest and best methods and support at their disposal for your home improvement project. Does the contractor have design skills/experience? Often their experience in jobs will give them an eye for aesthetic details. You may be able to get some great tips from your contractor to make the job even better pleasing to the eye! Their experience in creating shapes and designs with concrete pavers in particular places and for particular projects might be invaluable. If they do not have this experience, you may have to hire someone else to help you with the design, if needed. Do they subcontract out any part of the job? To whom? You could ask the same questions of the subcontractor as to the contractor. Who will be supervising? Will workers be left alone without direction? How many jobs does the company take at a time? What paver brands do they usually recommend? Why? Make sure you like the pavers they prefer to use before you sign on with them. Will there be any damage or disruption (such as clutter or materials) on neighbors’ property? Or on town property? Where will materials and tools be kept? For example, you will probably have pallets of brick laying around your yard for a few days. Will they be on the grass? On concrete or driveway? In the street? This is all important to know before the work begins. When will the project start? When will it finish? Does the company/contractor have a reputation for punctuality and reliability? Will they provide a detailed estimate, and is it free? Do they follow as close as possible to their estimate? This is where references may come in handy. What are the payment terms? Many hardscape contractors ask for 1/3 at the start, 1/3 after delivery of materials, and 1/3 at completion. Ask for a detailed list of the materials, labor, and other fees that you are being charged. This will be important to compare to other proposals prepared by competing contractors. Make sure nothing is left out of the contract. Do they include cleanup of your yard due to machine work and other excavation? Make sure there will be no “gotcha!” extras waiting for you on job completion. Will the paver contractors provide a warranty for his/her work? How long? Is it limited/full? Does the manufacturer of the materials (such as in the case of concrete pavers) provide any kind of warranty?